Have you trimmed up? I'm not impertinently referring to your personal weight or fitness, I'm merely asking in the colloquial manner of my local area if you have decorated your Christmas tree yet? In my family we range from those who put their decorations up at the end of November (my sisters) to those who only put their tree up on Christmas Eve (my Mum!). We're somewhere in between in our household, though in recent years decorating has fallen later and later thanks to busy workloads and DIY. Putting a tree up is a bit of a ritual, and I like to have Nat King Cole on the record player, mulled wine simmering on the stove, and to dress for the occasion. This year I dressed down more than usual, wearing practical trousers for all of the hefting boxes and sitting on the floor that the task entails. 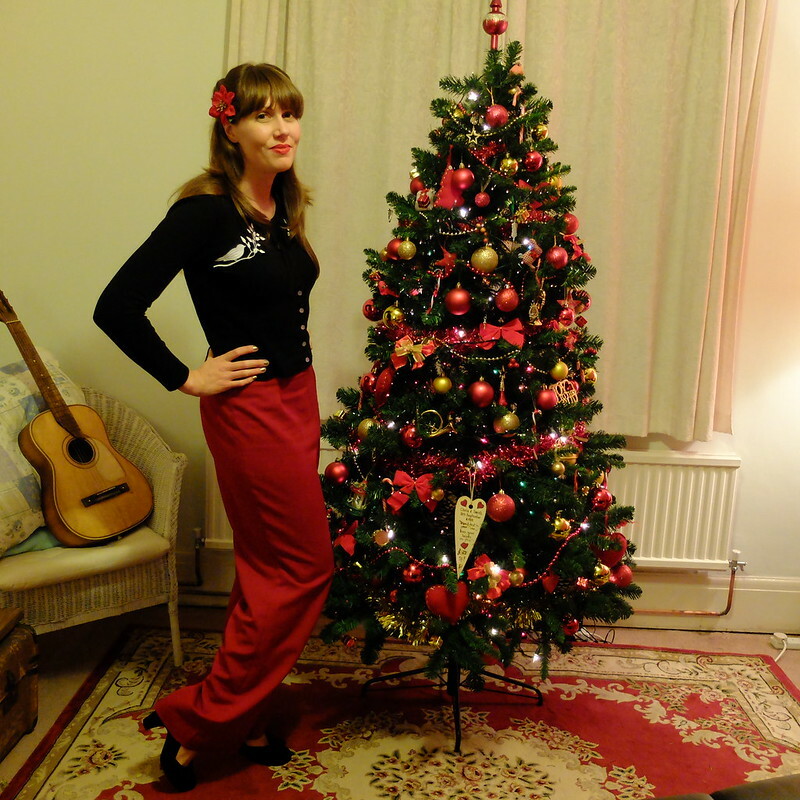 They're pretty fabulous trousers though, being my third pair of the House of Foxy's swing trousers, an absolute wardrobe staple for me, and this time in a cheery and festive red. Paired with a pretty but cosy cardigan that I won in a contest from Voodoo Vixen, and my trusty 1950's reissued court shoes from Clarks, I felt very festive but was super comfortable. 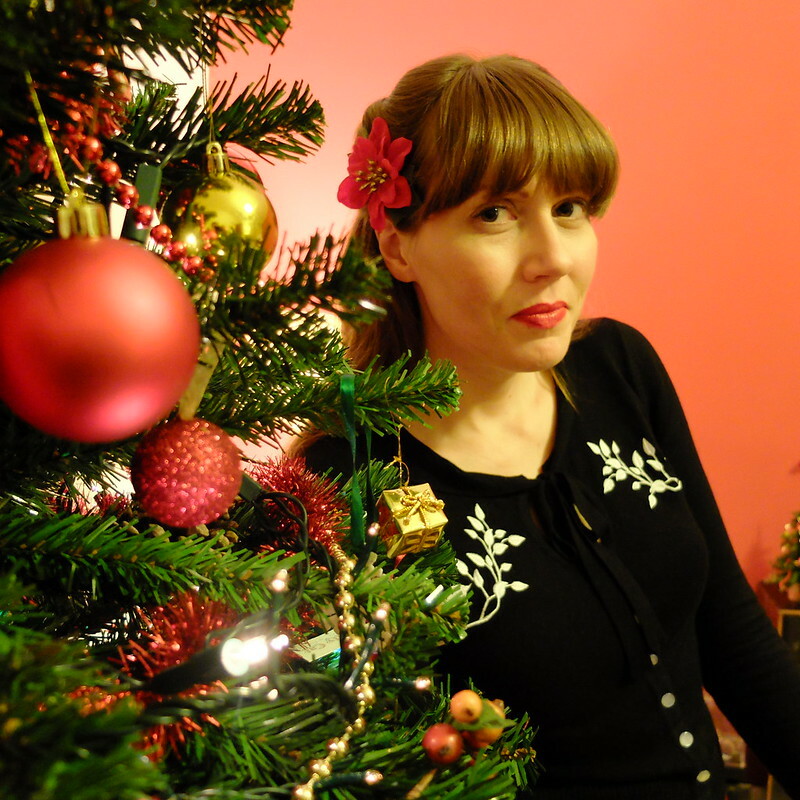 The finishing touch was the lovely Poinsettia in my hair, that is actually one of a pair of shoe clips from Alternate Normality. 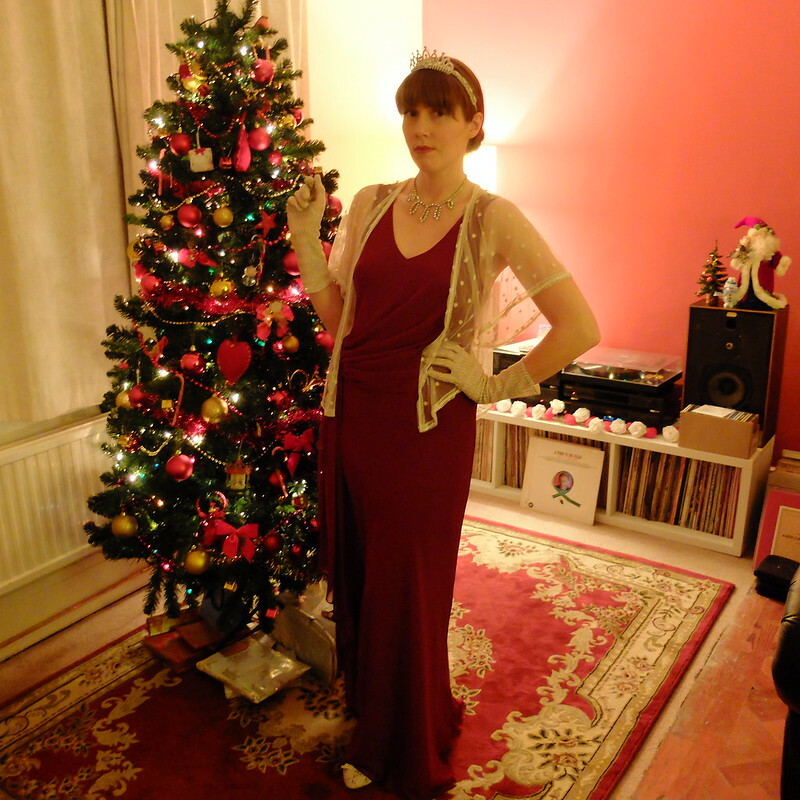 We dressed up to the nines then for our Christmas party, which this year was Downton Abbey themed. It seemed particularly fitting after my trip to Highclere earlier this year. 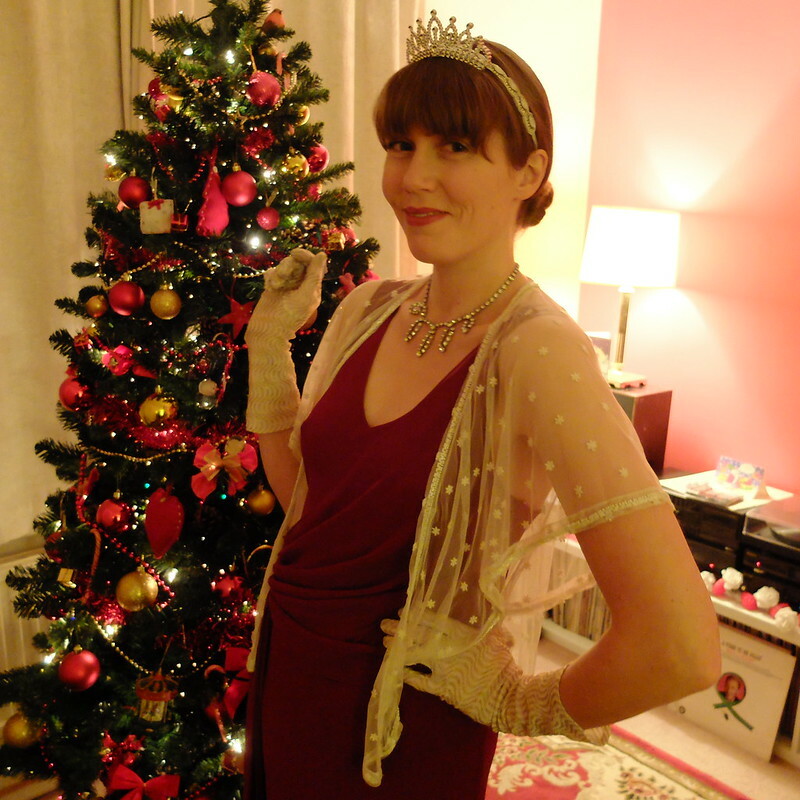 The dress was bought from a closing-down boutique for a fiver, and the little beaded shrug was a possible wedding accessory bought in the sale in Debenhams and was never worn. I accessorised further with some cream and gold vintage gloves from my collection, and a really gorgeous rhinestone necklace that belonged to my grandmother in the 1950s. 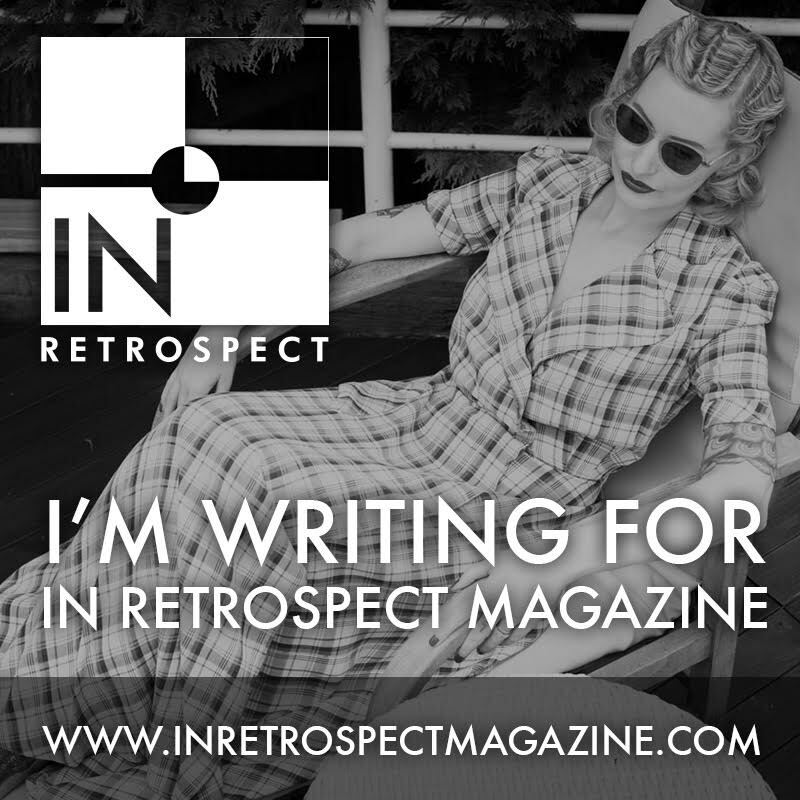 I already had the plastic tiara (doesn't everyone have one?). Dressing up turned out to be very amusing as the majority of our guests didn't receive the message about the dress code, and so turned up in their normal attire. We referred to them as "commoners" for the rest of the evening. 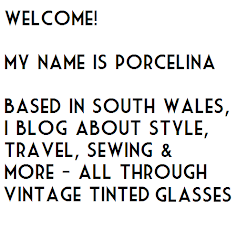 I was of course Lady Porcelina. We have a few more opportunities over the next few weeks for dressing up, which I am most excited about. Now that I'm off work, I actually have time to stand and stare in front of the wardrobe, and take a bit more time pulling things together. As for Christmas day, I will no doubt dress-up rather than dress down. I know a lot of people take great pleasure on the day to lounge in their pyjamas - or a onesie, heaven forbid - but why pass up an opportunity to play dress up? What about you - are you dressing up or dressing down for Christmas? 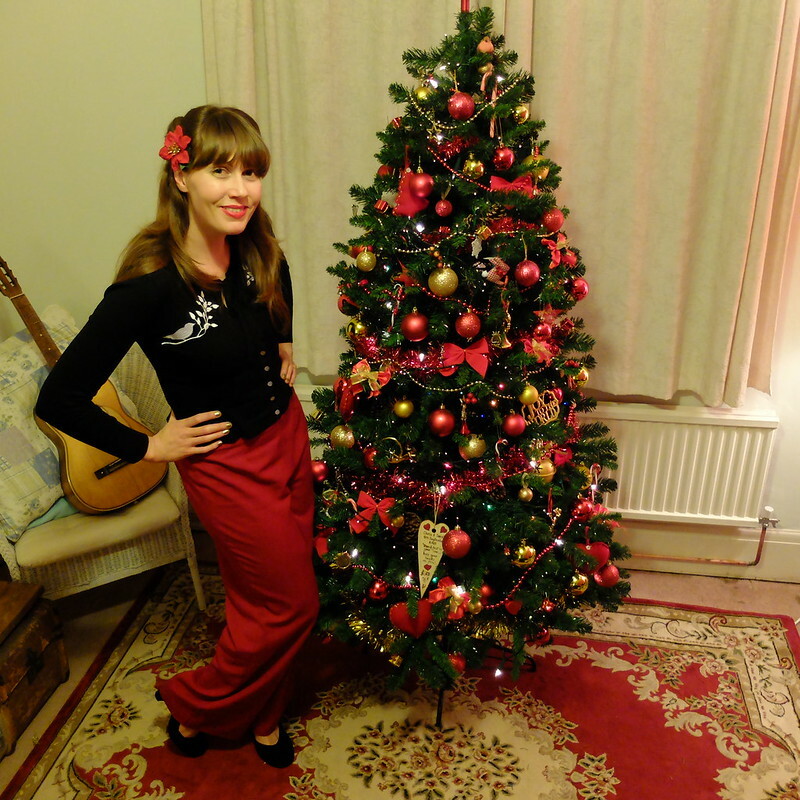 Love this outfit and you coordinate with your tree! Love both of these outfits! You also did an amazing job with your Christmas tree! The red and gold play together beautifully. I agree! Any reason to dress up is a good on in my book. You should have referred to them as the help! and asked them to run and fetch you another glass of champagne! Ha! Or asked them to go and scrub the toilets. I love both your outfits. 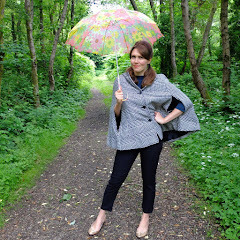 Especially that cardigan! I think the tiaras came in a pack of five from Tesco!! Bought for Kate and Will's wedding. Don't feel too bad - remember I don't have a metallic hair flower..
Two fab outfits there - next time you have a themed party, you should put some spare bits in a box so your guests have no excuse. I have no idea what I will be wearing, though the beach pyjamas will probably make an appearance at some point. (We get a week off, so there will be plenty of opportunities for them to come out.) I love them, they're the closest thing to still being in nightwear while being dressed that I know. Hear, hear!!! Life is too short to not dress up often, if you ask me. Both of these looks are glam, chic and very, very pretty. Blissful Christmas wishes, sweet lady! Your tree is super gorgeous, and so is that red gown! What a great find, I've yet to add a full length gown to my closet but I'd really like to. What a perfect blend of fun and glamorous the party sounds! Fabulous outfits, and your tree is so pretty! I always dress up, for the same reason as you: Christmas is one of the few times in the year that I have a legitimate excuse to do it, so no way am I missing out! Not dressing up? What a shame. I agree with Mim, a dressing up box for lazy visitors next year. Two smashing outfits. Glad the wedding shrug got a fancy outing in the end. Definitely have to dress for Christmas! Be it the Christmas jumper, new pyjamas or a party frock. Wouldn't be Christmas without the outfit planning. I really love your casual outfit. Chic and elegant. And you look stunning as lady Porcelina. Very regal. That is so cool you dressed up to decorate. Your tree is gorgeous in those classic red+gold colors. I love both outfits, especially the red maxi and lace cardigan. You had a great and fantastic 2015, Porcelina. Here is wishing you a Very Happy New Year 2016! You are a true vision in your holiday attire. I agree!! Dressing up is fun and makes every event special. Thank you for sharing your beautiful headwear with Hat Attack!